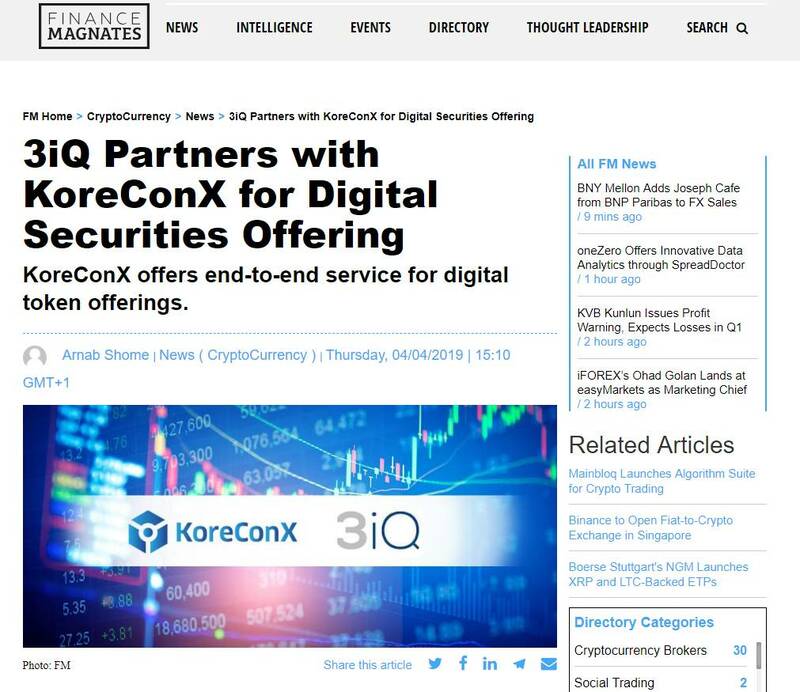 KoreConX announced recently that 3iQ Corp. (3iQ), Canada’s first regulated multi cryptoasset portfolio manager, has chosen the KoreProtocol for their Digital Securities Offering. Founded in 2012, the company is the first Canadian investment fund manager to fully comply with the terms and conditions with the Canadian securities regulatory authorities to manage a multi-crypto asset investment fund, offering exposure to accredited investors for the first time. 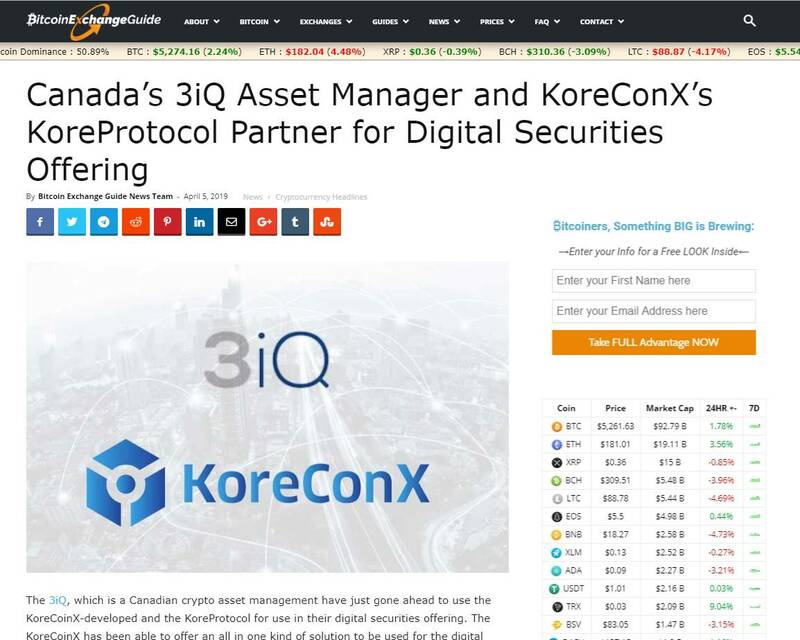 The 3iQ, which is a Canadian crypto asset management have just gone ahead to use the KoreCoinX-developed and the KoreProtocol for use in their digital securities offering. The KoreCoinX has been able to offer an all in one kind of solution to be used for the digital securities. It is including different services like trading, issuance, settlement, clearing, management, reporting, custodianship and corporate actions. 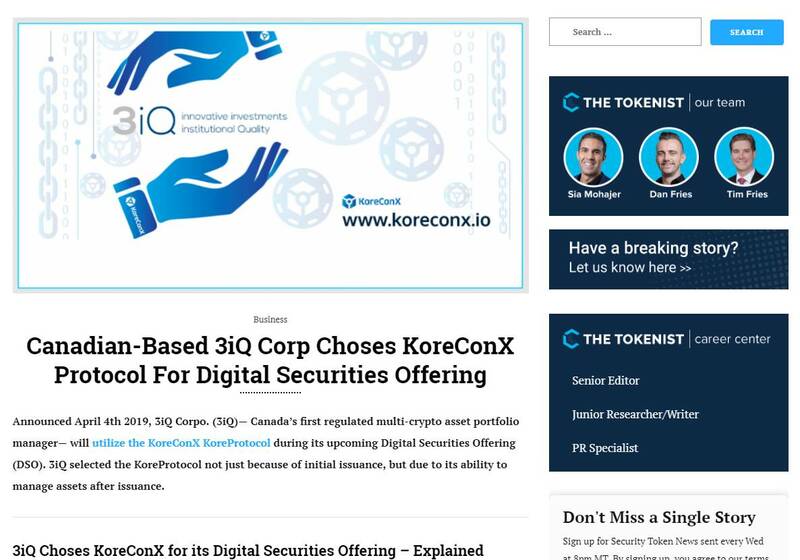 KoreConX announced on Thursday that 3iQ Corp. (3iQ), a Canada-based regulated multi crypto asset portfolio manager, has chosen the KoreProtocol for its Digital Securities Offering. 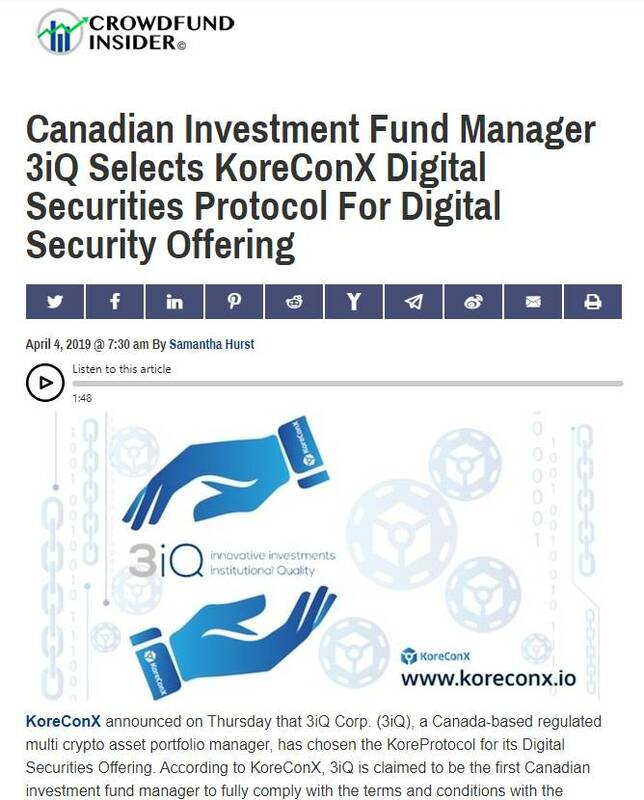 According to KoreConX, 3iQ is claimed to be the first Canadian investment fund manager to fully comply with the terms and conditions with the Canadian securities regulatory authorities to manage a multi-crypto asset investment fund, offering exposure to accredited investors for the first time. Announced April 4th 2019, 3iQ Corpo. (3iQ)— Canada’s first regulated multi-crypto asset portfolio manager— will utilize the KoreConX KoreProtocol during its upcoming Digital Securities Offering (DSO). 3iQ selected the KoreProtocol not just because of initial issuance, but due to its ability to manage assets after issuance. 3iQ was founded in 2012. The company is Canada’s first-ever digital asset investment fund manager to fully comply with the rules and regulations established by Canadian securities regulatory authorities. 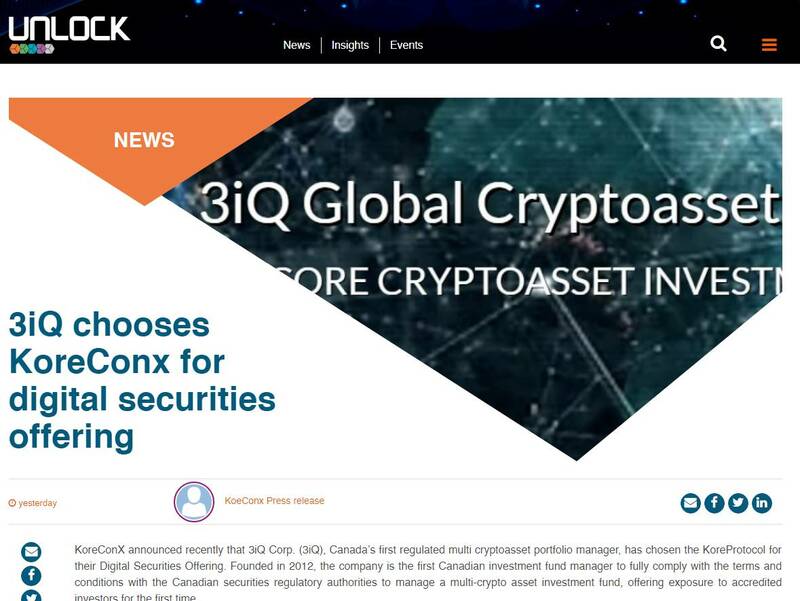 Canadian crypto asset portfolio manager 3iQ has decided to use KoreConX-developed KoreProtocol for its digital securities offering. KoreConX offers an “all-in-one” solution for digital securities including services like issuance, trading, clearing, settlement, management, reporting, corporate actions, and custodianship. Moreover, to ensure access to capital and liquidity for private investors, its AI-based platform connects companies to both capital and secondary markets. A duo of companies has just announced a new partnership, created to tackle the growing digital securities sector. Both KoreConX and BankRoll hope that their complimentary services will be able to aid in the continued development of the industry. With this partnership, BankRoll brings a developed and proven platform to facilitate crowdfunding campaigns. KoreConX is able to offer a variety of services to ensure the process remains compliant with regulations set forth by the government. 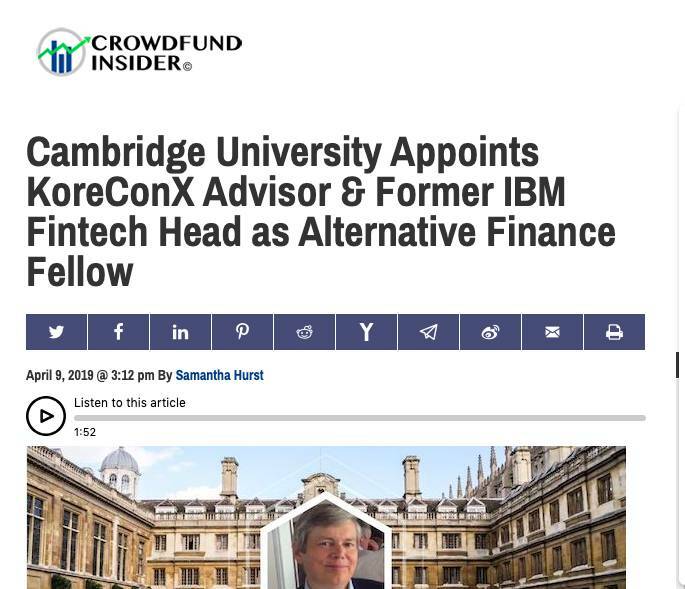 Blockchain startup KoreConX has partnered with Reg A+ equity crowdfunding platform BankRoll to make fundraising easier. KoreConX is a secure permissioned blockchain ecosystem for fully compliant tokenized securities worldwide. The platform manages the full lifecycle of tokenized securities including the issuance, trading, clearing, settlement, management, reporting, corporate actions and custodianship. It offers a single environment to connect companies, investors and broker-dealers. KoreConX is proud to announce a partnership with Stratigis Capital Advisors Inc. ("SCA"), a Canadian investment boutique with extensive experience in managing investment funds. SCA is registered with the Ontario Securities Commission as a Portfolio Manager, Exempt Market Dealer and Investment Fund Manager, with the Autorite des Marches Financiers as Investment Fund Manager and the British Columbia and Alberta Securities Commission as an Exempt Market Dealer. KoreConX is proud to announce a partnership with Stratigis Capital Advisors Inc. (“SCA”), a Canadian investment boutique with extensive experience in managing Investment Funds. SCA is registered with the Ontario Securities Commission as a Portfolio Manager, Exempt Market Dealer, and Investment Fund Manager, with the Autorite des Marches Financiers as Investment Fund Manager, and the British Columbia and Alberta Securities Commission as an Exempt Market Dealer. KoreConX has announced its partnership with Metis Management Consultancy, a UAE-grown consultancy firm focused on providing services to SMEs in the MENA region. The company will become part of KorePartner’s Ecosystem, a group of selected companies that works closely with KoreConX to ensure that small and medium enterprises have all the elements they need to thrive. Blockchain-based business management platform KoreConX has entered into a partnership with Middle East SME advisors Metis Management Consultancy. Established in the UAE in 2014 by founding partners Nayef Shahin and former EY and KPMG employee Hassan Safi, Metis Management Consultancy provides services in business planning and business strategy development, performance improvement, implementations, and finance and tax planning among other areas, with a specialist focus on small and medium enterprises (SMEs) in the MENA region. Security Token-Oriented Firm KoreConX Partners with Australian Startup SME Brokers. KoreConX, a security token-oriented company, announced that it had partnered with SME Brokers, which will use the KoreToken protocol and security token platform provided by KoreConX. Mercury.Cash Picks KoreToken as Security Token Protocol for its STO. 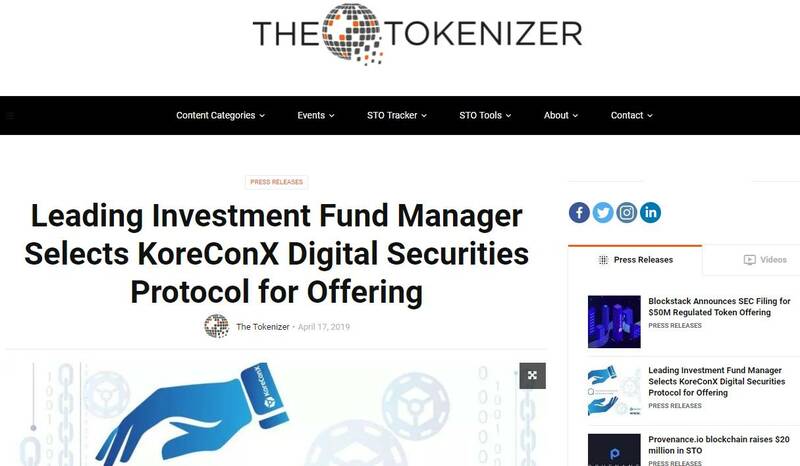 KoreConX, a company that operates a permissioned blockchain ecosystem aimed at creating tokenized securities, announced on Thursday that its KoreToken was picked by Mercury.Cash, a Florida-based crypto wallet provider, as the official security token protocol to conduct its security token offering (STO). Mercury.Cash, a wallet and emerging crypto exchange, has selected KoreConX’s services for their security token offering (STO), according to a release from KoreConX. Mercury.Cash a fully licensed crypto and remittance exchange authorized to do money transmission by Office of Financial Regulation with Money Transmitter License in Florida. KoreConX announced earlier this week that Evoke Capital will now be integrated into its KorePartners ecosystem. The KorePartner ecosystem is a group of selected companies that support the KoreConX security token protocol and adhere to KoreConX’s strict governance standards. KoreConX is proud to announce Evoke Capital will now be integrated into the company's KorePartners ecosystem. Evoke Capital will become part of the KorePartner ecosystem, a group of selected companies that support the KoreConX security token protocol and adhere to our strict governance standards. KoreConX's KorePartners are from around the globe and bring the necessary expertise that a company will need to launch a fully compliant security token in multiple jurisdictions. KoreConX Announces David Weild IV As the Keynote Speaker at the KoreSummit. Considered the father of the JOBS Act, Weild is also a member of KoreConX Advisory Board. KoreConX is proud to announce David Weild IV as the keynote speaker at the KoreSummit to be held in New York on October 3. Weild joined the company's Board of Advisors in June and is now one of the main figures in the first event about the KoreToken, a fully compliant security token developed by the organization. KoreConX Announces David Weild IV As the Keynote Speaker at the KoreSummit - KoreConX is proud to announce David Weild IV as the keynote speaker at the KoreSummit to be held in New York on October 3. Weild joined the company's Board of Advisors in June and is now one of the main figures in the first event about the KoreToken, a fully compliant security token developed by the organization. KoreSummit, New York, October 03, 2018 - The first stop will be in New York on October 03, 2018. This is an invite-only event in which attendees will be able to learn more about "KoreToken," a fully-compliant security token protocol for managing the end-to-end lifecycle of security tokens. "Koresummit First Stop: New York. Key Speakers Will Discuss The "Koretoken," A Fully-compliant Security Token Protocol" KoreConX, the all-in-one platform for managing all compliance activities and security tokens that is revolutionizing Global Private Capital Markets, announces the beginning of a global tour that will gather partners, advisors and key figures of the Security Token sector. "KoreConX to Combine Blockchain Technology With Artificial Intelligence" A Toronto-based company that helps private firms raise money is among those entering the emerging field of combining blockchain and artificial intelligence technologies. 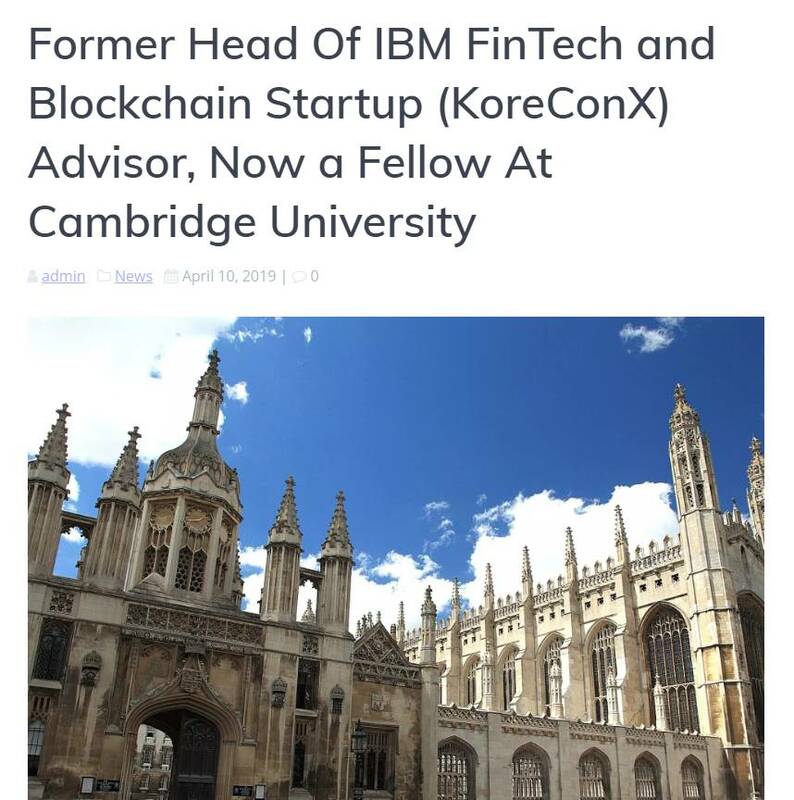 "KoreConX Platform Will Add Blockchain & Artificial Intelligence Tech Soon" KoreConX will implement artificial intelligence and blockchain technology to improve the efficiency of their platform. "KoreConX Names Kiran Garimella Chief Scientist, CTO" Dr. Garimella brings more than 25 years experience in information technology, consulting and financial services. "Wild Wild West of ICOS - Time to Move over Regulated ICOs are Coming" Those that can remember the wild wild west of crowdfunding back in 2010-2011 will have a feeling of dejavu seeing the 2017 ICO market take off.